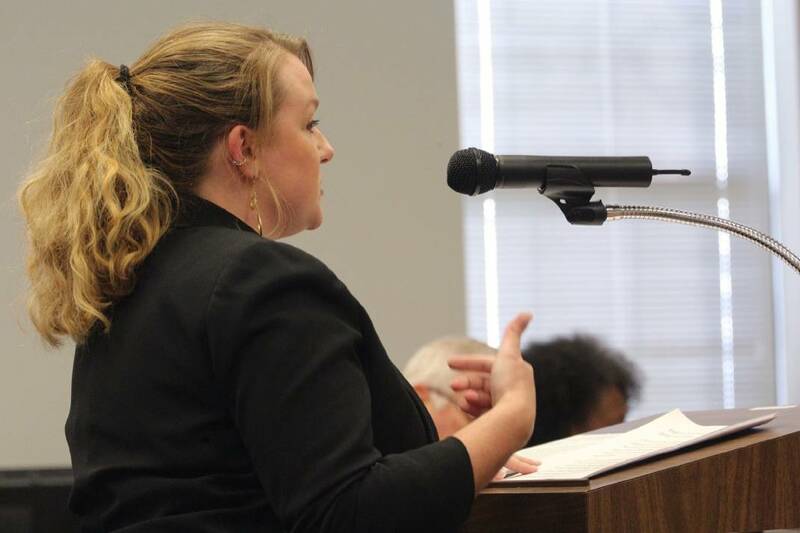 Meghan Phillips speaks about the school bus contract Hamilton County Schools currently holds during a school board meeting Thursday, September 20, 2018, at the Hamilton County Department of Education in Chattanooga, Tennessee. Phillips said her child has been dropped off more than a mile from her residence in the past and has heard of a variety of other issues with the company, and she was hoping to encourage the school board to work with a different company. On Aug. 17, Meghan Phillips' son, a kindergartner at East Ridge Elementary School, rode the school bus for the first — and last — time. Tre Phillips was dropped off at the wrong stop, more than a mile from his correct bus stop, despite an identifying bus rider tag on his backpack. Phillips says the action by his bus driver was egregiously negligent. She implored the Hamilton County Board of Education at a meeting Thursday not to renew its contract with Durham School Services, the bus service the county uses despite a number of high-profile incidents. "I'm sure your imaginations are reeling, as mine is, with visions of horrific or even fatal consequences that could have happened all due to this employee's egregious acts of gross negligence," Phillips told school board members. "Durham School Services fosters a company culture of incompetence and negligence that often puts our children in harm's way. Despite their promises, little has changed in how Durham operates since the Woodmore tragedy." On Nov. 21, 2016, bus driver Johnthony Walker crashed a bus carrying 37 Woodmore Elementary School children on Talley Road in Brainerd. Six children died and dozens were injured. After the crash, the school district and Durham both committed to making policy and safety changes, including hiring more bus monitors, adding more cameras and implementing a feedback management system. But Phillips said those changes have been for naught if drivers still do not follow safety protocols. "Do not renew Durham's contract for the next fiscal year, instead invest in a company with policies and procedures that prioritize our children's safety invest in a company that implements proactive steps that ensure our children make it home in one piece," she said. "I know you care about our children, I know you actively fight for their success and their well-being. I'm asking you today to please, please stand up for their safety. We can and must do better for our children." Board member Karitsa Mosley Jones, of District 5, told Phillips she was not a fan of Durham. "I struggle with the whole bus thing because I am not a fan of Durham, and Durham knows I am not a fan of Durham," Mosley Jones said. "I am not a fan of our current system." Joe Smith, of District 3, apologized to Phillips. "I'm sorry for what you and your child had to go through. There's no excuse. It shouldn't happen," he said. The district's current contract with Durham ends after the 2018-2019 fiscal year. In the next few months, the district hopes to conduct an audit of the current transportation system and bus routes, said Chief of Operations Ken Bradshaw, who also addressed the board at Thursday's meeting. In December, the district plans to release a new request for proposal for bids for a new contract. Bradshaw hopes to bring a recommendation to the board by March. However, in 2013, the last time the district sought bids for a contract, Durham was the only company to submit a bid. Two years ago, board members reviewed transportation options such as moving the bus system in-house, and it was determined that it would cost the district $10 million just to purchase the buses, according to Christy Jordan, assistant superintendent of finance, and board member Steve Highlander, of District 9. After the Woodmore crash, the school board made a push to hire more independent contract drivers, boasting about their safety record. Independent drivers own and operate their own buses for the district and, in 2016, covered 49 of the district's nearly 250 routes. More than 20,000 students ride buses across the district, and board members acknowledge that transportation is complicated. "Probably one of the most complicated things we have to do with is transportation," Smith said. "I can see the multitude of problems we have with transportation." Regardless, Phillips urged the board to push for more accountability from its transportation provider. She recommended bus monitors be added to all buses with elementary school students, required quarterly updates and posting complaints publicly. "As a county, we must set forth our own expectations that promote the welfare and safety of our children, and outline those expectations to each company that desires to bid on our bus routes," Phillips said. Durham did not respond Friday to a request for comment.